A wide variety of Manual Stop Valves / Isolation Valves, suitable for working pressures from zero up to 500 bag (6,000psi) are available. Most Hale Hamilton Stop Valves are fully pressure balanced and thus require a very small operating torque, even at the highest pressures. 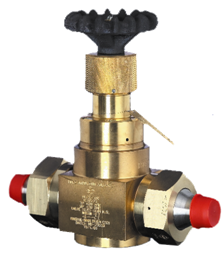 Many valves in the range are suitable for both pneumatic and hydraulic applications. Available in a variety of materials, the Hale Hamilton range of valves are used within many applications including; Military Markets, Gas Filling, Gas Mixing and Supply, Power Generation, Offshore Oil & Gas, Pharmaceutical, Medical, Compressor, Laboratory and many other Industrial markets. Many products carry; NATO, PED, PED approvals, along with adiabatically shock tested variants for use within high pressure Industrial & Medical Oxygen applications..
Series SV47, 60 & 130 area range of Manually actuated high presure stop valves available in 6, 12, 16 & 20mm orifice diameters, G1/4 to 2 5/16 -12 UNF port connections & cartridge mounted with operating pressures up to 420 bar and body materials of Nickel Aluminium Bronze, Brass or Stainless Steel. N Series are a range of fully Balanced, Manually actuated, high pressure stop valves available in 6, 11, 19 & 25mm orifice diameters, G1/4" to G1 1/2" threaded connections, welded inline and flange mounted with operating pressures to 500 bar, CV values from 0.8 to 11 and body materials of Nickel Aluminium Bronze, Brass or Stainless Steel.